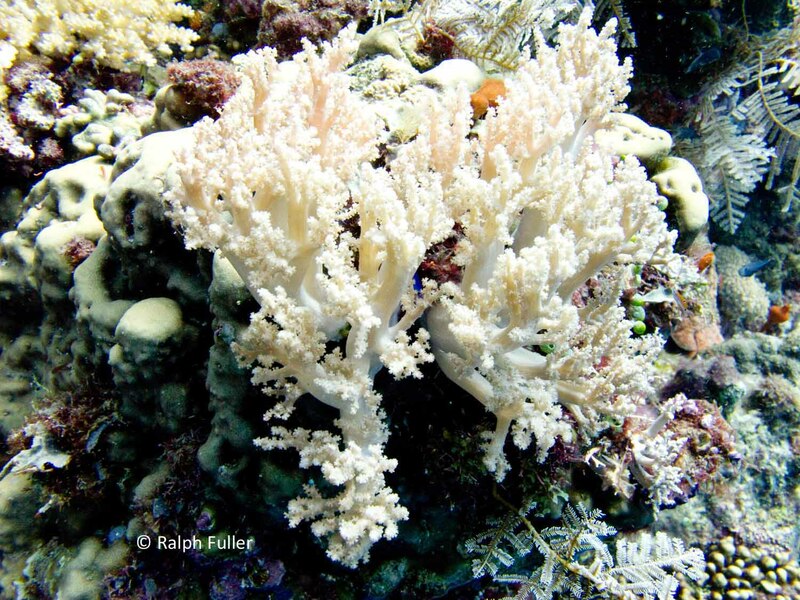 As opposed to the sometimes-use of the term “soft coral” for everything that isn’t a stony coral, “soft corals” is also the informal name for a specific type of animal in the order Alcyonacea. Alcyonacea polyps (al-see-nay‘-see-ah, from the Greek word for kingfisher) are like all coral polyps, with symmetrically radial central body sacs that each contain a mouth and gut surrounded by tentacles to capture food. 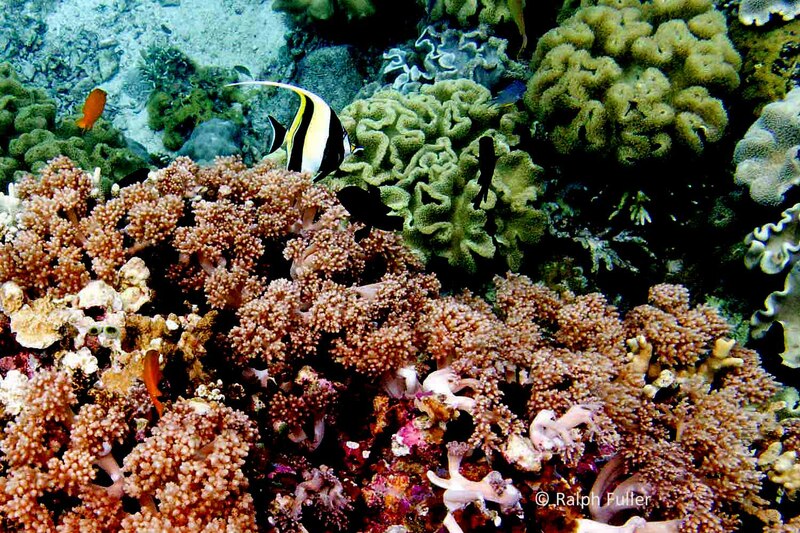 A Moorish idol passes by a variety of soft corals at Apo Island in the Philippines. Exquisite Beauty They’re octocorals, with eight tentacles. 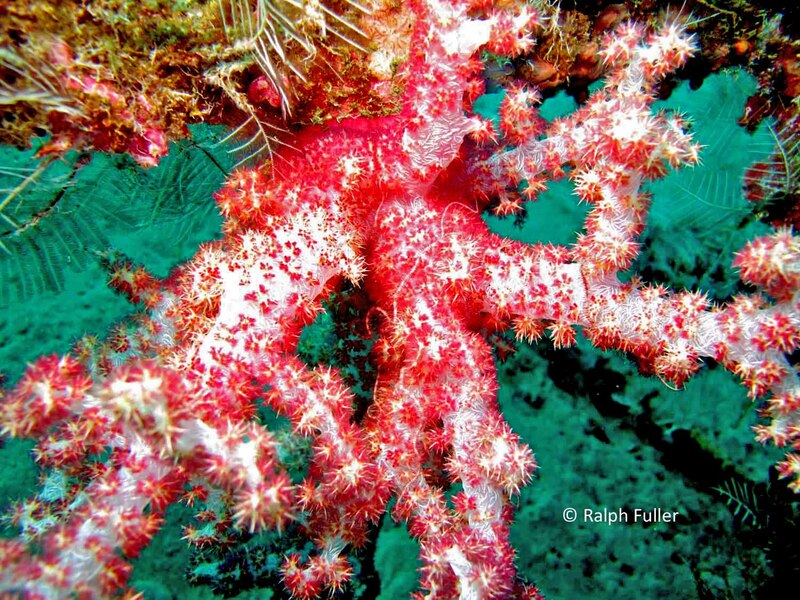 Like all octocorals, they’re pinnate – with polyps clustered on the surface, often at the branch tips, extending their tentacles to produce a feathery, flower-like appearance. And they’re beautiful. They don’t build reefs, they adorn them. Hundreds of Species Soft corals are difficult to identify without taking them to a laboratory and examining under a microscope. Since that’s unreasonable for me to do, I’m foregoing identifications — other than to say that the soft corals in this post, photographed in Australia and the Philippines, are probably examples of Divaricate Tree Corals in the genus Dendronephthia. There are more than 250 species in this genus. Branching Structures Whereas stony corals secrete calcium that constitutes the foundation of reefs, alcyonacean soft coral polyps live as parts of pliable, rubbery branching structures supported by embedded skeletal spicules, small slender pointed calcareous or siliceous structures (similar spicules are found in sponges). The central stalk and spongy tissues can expand, contract or wrinkle to a significant degree. They generally grow at much faster rates than hard corals. Like other coral polyps, many alcyonaceans live with the single-celled symbiotic algae called zooxanthellae embedded within their tissues, providing both their colors and, due or photosynthesis, a significant amount of their nutrients. But like other corals they also filter microscopic plankton from the current for food. Largely Animals of the Indo-Pacific Alcyonacean soft corals are overwhelmingly denizens of the Indo-Pacific basins. While species are numerous in those oceans, only a few species are found in the Caribbean and tropical Atlantic, and those generally dwell below 100 feet. One characteristics of alcyonaceans is that they are rarely encrusted with other organisms. Partly, this is because they secrete chemicals that inhibit growth of other marine organisms – making them a frequent focus of medical research. Principal Sources: Indo-Pacific Coral Reef Field Guide, Gerald R. Allen and Roger Steene; Coral Reef Animals of the Indo-Pacific, Terrence M. Gosliner, David W. Behrens, Gary C. Williams; Reef Coral Idenficiation, Paul Human, Ned DeLoach; National Oceanic and Atmospheric Administration; University of California Museum of Paleontology, Berkeley.